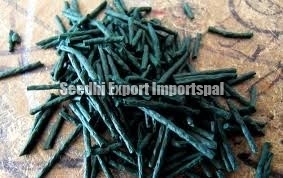 We provide Spirulina Sticks that are reckoned for being highly effective in several health problems. Spirulina is a microalga that can be consumed by humans and animals. It is usually taken by humans as a nutritional supplement and is made primarily from two species of cyanobacteria: Arthrospira platensis and Arthrospira maxima. Arthrospira is cultivated worldwide; used as a dietary supplement as well as a whole food; and is available in tablet, flake and powder form. It is also used as a feed supplement in the aquaculture, aquarium and poultry industries. Most cultivated spirulina is produced in open channel raceway ponds, with paddle-wheels used to agitate the water. The largest commercial producers of spirulina are located in the United States, Thailand, India, Taiwan, China, Pakistan, Myanmar, Greece and Chile.